This image shows the "last hurrah" of a star like our sun. The star is ending its life by casting off its outer layer of gas, which formed a cocoon around the star's remaining core. Ultraviolet light from the dying star makes the material glow. The burned-out star, called a white dwarf, is the white dot in the center. Our sun will eventually burn out and shroud itself with stellar debris, but not for another 5 billion years. NASA's Hubble Space Telescope captured this view. Image and caption by NASA. June 2011: An image of a typical sunspot with the Earth shown to scale. The image has been colourized for aesthetic reasons. This image with 0.1 arcsecond resolution from the Swedish 1-m Solar Telescope represents the limit of what is currently possible in terms of spatial resolution. The Sun is the star at the centre of our Solar System. It is almost perfectly spherical and consists of hot plasma interwoven with magnetic fields. 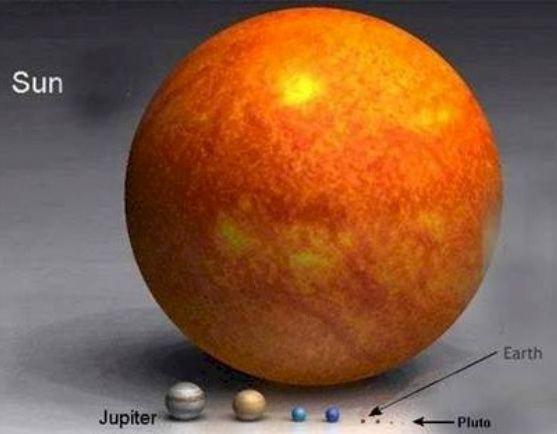 It has a diameter of about 1,392,000 km, about 109 times that of Earth, and its mass (about 2×1030 kilograms, 330,000 times that of Earth) accounts for about 99.86% of the total mass of the Solar System. Chemically, about three quarters of the Sun's mass consists of hydrogen, while the rest is mostly helium. Less than 2% consists of heavier elements, including oxygen, carbon, neon, iron, and others. The Sun's stellar classification, based on spectral class, is G2V, and is informally designated as a yellow dwarf, because its visible radiation is most intense in the yellow-green portion of the spectrum and although its colour is white, from the surface of the Earth it may appear yellow because of atmospheric scattering of blue light. In the spectral class label, G2 indicates its surface temperature of approximately 5778 K (5505 °C), and V indicates that the Sun, like most stars, is a main sequence star, and thus generates its energy by nuclear fusion of hydrogen nuclei into helium. In its core, the Sun fuses 620 million metric tons of hydrogen each second. Once regarded by astronomers as a small and relatively insignificant star, the Sun is now thought to be brighter than about 85% of the stars in the Milky Way galaxy, most of which are red dwarfs. As the star closest to Earth, the Sun is the brightest object in the sky. The Sun's hot corona continuously expands in space creating the solar wind, a stream of charged particles that extends to the heliopause at roughly 100 astronomical units. The bubble in the interstellar medium formed by the solar wind, the heliosphere, is the largest continuous structure in the Solar System. Phenomena such as solar flares and sunspots are evidence of the Sun's strong magnetic field, which changes on a roughly 11-year cycle. The Sun is currently travelling through the Local Interstellar Cloud in the Local Bubble zone, within the inner rim of the Orion Arm of the Milky Way galaxy. Of the 50 nearest stellar systems within 17 light-years from Earth (the closest being a red dwarf named Proxima Centauri at approximately 4.2 light years away), the Sun ranks 4th in mass. The Sun orbits the centre of the Milky Way at a distance of approximately 24,000–26,000 light years from the galactic centre, completing one clockwise orbit, as viewed from the galactic north pole, in about 225–250 million years. Since our galaxy is moving with respect to the cosmic microwave background radiation (CMB) in the direction of constellation Hydra with a speed of 550 km/s, the sun's resultant velocity with respect to the CMB is about 370 km/s in the direction of Crater or Leo. The mean distance of the Sun from the Earth is approximately 149.6 million kilometres (1 AU), though the distance varies as the Earth moves from perihelion in January to aphelion in July. At this average distance, light travels from the Sun to Earth in about 8 minutes and 19 seconds. The energy of this sunlight supports almost all life on Earth by photosynthesis, and drives Earth's climate and weather. The enormous effect of the Sun on the Earth has been recognized since prehistoric times, and the Sun has been regarded by some cultures as a deity. An accurate scientific understanding of the Sun developed slowly, and as recently as the 19th century prominent scientists had little knowledge of the Sun's physical composition and source of energy. This understanding is still developing; there are a number of present-day anomalies in the Sun's behaviour that remain unexplained.